Noritake introduces 3 new patterns in the Platinum and Golden Wave collection, available nationwide. The expansion of this design into colors is a natural progression beyond what has already been introduced in glass giftware and stemware. Noritake has launched 3 new dinnerware patterns to expand on the great success of Platinum Wave and Golden Wave. Platinum Wave Ebony, Platinum Wave Indigo, and Golden Wave Chocolate. Currently available nationwide in select stores and online, these white porcelain patterns are available in place settings and matching accessories, all designed to mix and match with each other and the original patterns in the collection. Platinum Wave, Noritake’s #1 fine china pattern and a leading registry pattern nationwide, is a relaxed formal dinnerware, luxurious in design but also functional and reflective of a simple, modern feeling. The dishwasher-safe white porcelain features a classic scroll motif, interpreted as waves washing against the rim of the plate creating a bold, yet elegant presentation. Its introduction in 2008 was unprecedented as it immediately rose to prominence nationwide. The Platinum Wave dinnerware collection includes a selection of more than 30 accessories to create a cohesive table for both casual and more elegant occasions. Rounding out the collection is Platinum Wave stemware, with a platinum rim and the same beautiful scroll design etched into lead crystal. Yamazaki has licensed the design and is offering a coordinating flatware pattern – also called Platinum Wave. Its 18/8 stainless steel features the beautiful scroll design. 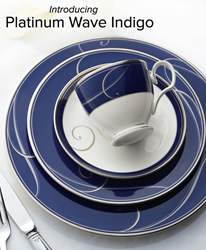 All items in the Platinum Wave collection are made of fine porcelain that is dishwasher safe. The multiple colors, shapes and accessories can be used casually or formally, allowing extensive table setting options to complement any event. Platinum Wave Ebony, Platinum Wave Indigo, and Golden Wave Chocolate are available now, along with the originals, Platinum Wave and Golden Wave. To see the entire product line, please visit NoritakeChina.com. Since 1904, Noritake has been bringing beauty and quality to dinner tables around the world. Superior artistry and craftsmanship, attention to detail, and uncompromising commitment to quality have made Noritake an international trademark during this past century. Today, Noritake is an acknowledged leader in tableware manufacturing and marketing with subsidiaries, factories, and affiliates around the world. Our products are sold to customers in over 100 countries and are used in hotels, restaurants, and airlines throughout the world. Join us in continuing the Noritake tradition of distinctive designs, innovative technology, and superior product quality.